Prominent rock formations circumscribe vast plateaux. 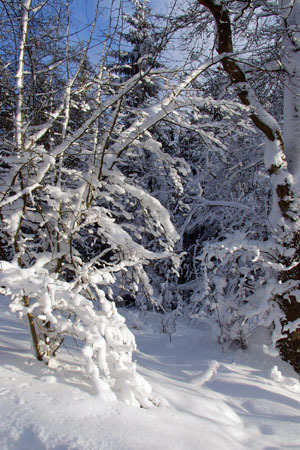 There are deeply cut creek valleys, swampy moors on the slopes of the mountain range ("Brücher") and many old forests with characteristic plant and animal communities. There is also farmland here with fields and pastures for free- ranging livestock. The natural boundaries of this region are formed by the course of the Nahe river in the south, the Saar far to the west, the Mosel in the north and the Rhine in the East. There are five large mountain ridges in the Hunsrück region: the Hochwald with the Erbeskopf (816m) in the west, which is the highest mountain in Germany west of the Rhine, the approximately 30km long quartzite ridge of the Idarwald with the Idarkopf (746m), the Lützelsoon with the Womrather Höhe (597m), the Soonwald to the southeast, which is made up of three parallel mountain chains and whose highest point is Ellerspring (657m), and finally, the Bingerwald with the Salzkopf (628m). Further up the Mosel river from these mountain ranges is the Hunsrück plateau, whose gentle undulations contrast with the rock formations of the high ridges. Are you interested in a little tour through the Hunsrück region? Those who wish to learn more about the beauty of the Hunsrück, its unique landscapes and villages, its diverse moods, its culture, and, not least, the people living there, should refer to the picture books of Uwe Anhäuser, who for many years has built up an artistic tribute to the region with his photographs and books.